The Temiars have been written about by explorers, missionaries, anthropologists, musicologists, linguists and poets amongst many others. The Temiar numbering between 14-20,000 people, are one of many groups of Orang Asli (Original People) that live in Malaysia and number less than 100,000 people, less than 1% of the population. 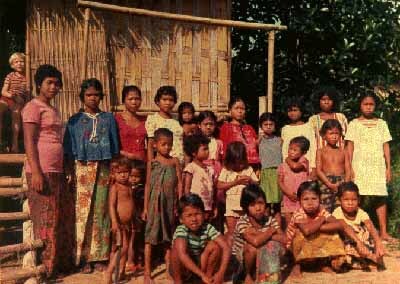 In Malaysia the Orang Asli, like the Malays (who are 55% of the population), are officially known as 'Bumiputera' (children of the earth) or 'natives of the country'. This is a title not given to the other 44% of the population who are made up mostly of Chinese and Tamils. The Temiar are an easy going peaceful people, and like many minorities in countries around the world, are slowly being pushed from their homelands by international timber companies, hydraulic power companies, and the Malaysian governments attempts to settle them out of the forest into reservations. Many Temiars live within or on the fringes of the rainforest, some live in towns and Temiar settlements can be found in the capital of Malaysia, Kuala Lumpur. Outside of the rainforest Temiars have worked in professions such as medicine, politics and law, within the retail trade and within the media and the arts. But even with their Bumiputera status still find it difficult if not almost impossible to open up a bank account or get a bank loan. Those Temiar that are still situated within or near the rainforest subsist on slash and burn cultivation, hill rice harvesting, fishing, hunting and trading. "Few Temiar are now 'tribespeople' any more: most of them have become peasants or proletarians belonging to one of the several indiginous minorities that make up Malaysia's ethnic mix" (Benjamin 5: 1993). The Temiar "do not see themselves as forest people. They see themselves as people who live in cleared spaces which happen to be surrounded by forest" (Jennings 25: 1995). The Temiar, as are all the Orang Asli, are administrated by the JHEOA (Department for Aporiginal Affairs). Within the last few years the Orang Asli have formed their own political organisation POASM (Orang Asli Association of Peninsular Malaysia). The Temiar language has been labeled as Aslian, "speakers of Austroasiatic, Mon-Khmer languages" (Roseman 17: 1991). The language is not a written language but linguists (eg Benjamin and Diffloth) have developed a modified version of the International Phonetic Alphabet (IPA) to write it down. The first Temiar/English dictionary was published in 1998, edited by Gordon Means with a foreword by Andy Hickson, this dictionary does not make use of the IPA, but a simplified version. This basic but well laid out book is of restricted use to scientists, but is a good start for those who want an introduction to the Temiar language. The Temiar are famous for non-violence, dreaming and seances. The Temiar child is taught "never to cause pain to any living thing which is in his power ... we find a society untainted by violent habits and inter-group conflicts" (Stewart 34: 1947). The Temiar "make their dreams the major focus of their intellectual and social interest, and have solved the problem of violent crime and conflict" (Stewart 33: 1951). This picture painted by Stewart is an idealised picture of the Temiar and may have more to do with Stewarts promotion of Senoi Dream Theory in America than how the Temiar actually live their lives. (For more information on the now 'discredited' Senoi Dream Theory it is reccommended that people read 'The Mystique of Dreams' by G. William Domhoff University of California Press: 1985). In regards to their seances, which the Temiar usually use as a basis for healing or mourning a popular film has been made. This film has often been described out of context "as a type of erotica, idealised in a way that travesties the Temiar. If you ask Temiar individuals why they trance they say things like, 'We must trance' 'I long/yearn to trance'" (Jennings 40: 1995). Trancing is done for many reasons, including healing and for fun. It is also a release from the confines of the physical world. The Temiar do place a great importance on dreams, but not in the organised way that Stewart suggests, there also appears to be an absence of conflict or violence within their society. This does not mean there is no violence, Temiars have been known to take revenge, they have fought in wars and they have defended themselves when they have to, just like most people around the world. And yet still the Temiar offer us one of the least violent cultures from around the world. Benjamin suggests that in a small-scale society such as the Temiars "there is no room to hide, and one just has to learn the difficult task of preventing conflicts from arising in the first place" (5: 1967). It has been suggested that many cultural concepts of the Temiars help prevent violence. "By the time they become adults, Temiars have learnt to feel anxious that their actions might cause someone else harm" (Benjamin 6: 1993). The Temiar also see other beings as more similar than different, or in other words, more like themselves than not, and show the respect due to oneself to other people they interact with. "Instead of alienating flowers, trees, or cicadas as inherently different from humans, Temiars stress their similarities: (Roseman 24: 1991). This concept of drawing others into our selves can be seen as a basic precept of Temiar thought. "The Temiars regard parent and child as tied together dialectically - as being simultaneously of the same and of different personal substance" (Benjamin 1: 1993). The world has much to learn from Temiar culture, paritcularly in terms of controlling violence, aggression, conflict and bullying. And in terms of sharing and respect. In a greedy and individualistc world it is very easy to sweep cultures like the Temiars under the carpet, to ignore them or to forget them. The Temiar want to grow and play a full part in Malaysian society and the world at large, do not want their culture to remain static but they also do not want to have it crushed by big business and politics. The Temiar feel pushed and pulled by organisations who make promises for their welfare and then never make good that promise. The Temiar have many positive things to offer us all, we need to ensure that their current needs are met in terms of the preservation of their homelands, particularly in the Kelantan area of Malaysia, and that they are given the rights and responsibilities of other Malaysian citizens. Stewart, K. PhD Thesis. 1947 LSE London.